Seminarians Kim Addison, Lorenzo Andreini and Ivano Millico were all ordained Deacons by Archbishop Vincent Nichols at Westminster Cathedral on Saturday 18 June 2011. The Order of Deacons is the first of the three Sacred Orders of the Church, and for those seminarians aspiring to priesthood, the ordination to the Diaconate is usually made in the final year of formation. Practically, the Deacon assists in the Mass by proclaiming the Gospel and helping the priest at the altar. He may also baptise, conduct marriages and funerals, and preside over liturgical services. At ordination, a temporary Deacon will make a commitment to celibacy and promise obedience to his bishop. 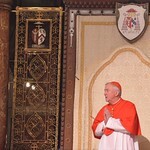 Full text of homily given by Archbishop Vincent Nichols. The clear instruction which we have received in this morning’s reading of the Gospel rings loud and true as we come to celebrate this Ordination to the Diaconate of Kim, Lorenzo and Ivano. For many years they have been preparing for this moment when they can commit their lives totally and publicly to the Lord, opening their hearts and souls to the grace of this Sacrament of Holy Orders and in their generous embrace of the commitment to life-long celibacy. The Gospel imperative is simple yet far reaching: ‘Set your hearts on his kingdom first.’ There it is. For all who seek to follow the way of the Lord, for all who seek to embrace the pathway of the ordained ministry, this is the fundamental invitation: that first place in our hearts belongs only to the Lord and to his Way, his Kingdom. The Gospel spells out the consequences of this dedication – at least the consequences that ought to follow: a freedom from anxiety, a sense of well-being, an appreciation of all that is constantly given to us, which is enough for our genuine needs. It is this promise that makes today such a happy moment. In embracing the Lord we embrace our own happiness, the most profound contentment the human heart can experience. He is the only one who can resolve the dilemmas of our fallen humanity and answer the deepest human longings. In responding to his call we find our true stability and freedom. So today we rejoice, with our three ordinands, in their vocation and in the happiness it will bring. Yet, at the same time, St Paul helps us to understand a little more of what is involved in this vocation. He speaks to us with astonishing honesty of the glories and the agonies which he has experienced in his journey of discipleship. In this he is a master teacher for us all. I was fascinated to learn that the word ‘paradise’ comes from a Persian word meaning ‘a walled garden’. When a Persian king wished to confer a special honour on someone dear to him, he made that person a ‘companion of the garden’, giving him the right to walk in the royal gardens in close companionship. Paul is telling us that in his experience, just once and never again, he had been like a companion with God in paradise. So, a vital part of setting our hearts on the Lord’s Kingdom is a longing to get a glimpse of the royal garden, a sense, however slight, of intimacy with the Lord himself. We are not like Paul. We may, just occasionally, when we are on tip-toe, just catch a brief and fleeting sense of the immensity of God and of His love for us. Indeed, day by day, in our prayer, we wait for his touch, for his warmth, soaking up his goodness and love. This is the constant foundation of our life in the Lord, the essential foundation of our ministry in the Church. But Paul also tells us about his agonies. Here too the language is powerful – ‘a thorn in the flesh’, an experience of searing pain and of recurring distress and disorientation. Yet Paul, in the end, tells us: ‘I am quite content with my weaknesses and with insults, hardships, persecutions and the agonies I go through for Christ’s sake.’ He tells us that he is content because in these experiences he comes to know the power of Christ’s grace: his weakness leaves him dependent on the Lord; the opposition he faces leaves him unmistakably reliant on the strength of God. The pathway which we seek to follow is like that. Our prayers will not take away the difficulties. God’s grace does not shelter us from mistakes, opposition, discomfort or agony. But step by step we hope to learn that far from being moments of dismay and despondency for us, these are times when the good Lord can draw us closer to himself and make us more fruitful in his service. In this spirit, you step out with fresh dedication today and embrace the commitment to celibacy. You do so, in the words I will use, ‘as a sign of your interior dedication to Christ’, and ‘for the sake of the kingdom’. Yes, celibacy is the language of the heart as well as of the body. It is the language of love, and, like all true love, the language of freedom. We rejoice in the sign of hope your commitment gives not only to us gathered here today but also within our largely uncomprehending society. Today we celebrate Mass in honour of our Blessed Lady. Her heart was totally set on the Kingdom of God and so she received the message of the angel so readily. Her willingness to trust through times of dismay and agony led to her glorious assumption into heaven. She is our model and our hope. Indeed, the opening words of the Mass, sung by the choir, express our feelings and our faith: ‘Hail holy Mother, the Child-bearer who has brought forth the King, the ruler of heaven and earth for ever.’ Yes, through her loving obedience she brought forth our Saviour. In a few moments, these men, newly ordained deacons, will receive the Book of the Gospels. They will become Gospel-bearers, in an echo of Mary the Child-bearer. We pray that they will bring forth the King, the ruler of heaven and earth, through their proclamation of the Gospel in their ministry of service, of prayer, of self-offering. That is the promise of this Sacrament of Holy Orders: that God will use us as his instruments to do the work of his Kingdom, drawing people to himself, through us, in ways we do not often see and more through our weaknesses than through our strengths. Kim, Lorenzo, Ivano we pray for you today that the Lord will use the generosity and courage he has given you to do his work in the hearts of all whom you will meet. Amen.